The scene takes place at the Griffith Observatory in Los Angeles, where the first T-800 shows up, naked, and steals the clothes off the backs of a bunch of punk rockers, including a young Bill Paxton. There have also been rumors floating around that the punks survive this encounter this time around, which is likely due to the older, or “Guardian” T-800 arriving on the scene. It also sounds like, since the punks survive, the first Terminator doesn’t have time to steal their clothes, which mean one of the participants in this brawl is naked. The Terminator Fans have a source close to the production who tells them, “The battle will be better then the T-800 and T-1000 from T2. The ground will break on the wrestling fight.” They go on to describe a brutal fight between the two incarnations that includes punching, kicking, wrestling, and even a pile driver, among other moves and strategies. We’re talking about a knock-down-drag-out free for all between two evenly matched foes. According to their report, the Guardian comes out on top, though he sustains substantial damage and has to wear gloves after this. That admittedly sounds pretty awesome, but there’s more to it. Their source also says that production company Skydance wasn’t happy with the initial footage of the fight, and instead of staging an expensive reshoot, decided to do the whole thing, both combatants, in CGI. There will apparently be moments when there are body doubles with the faces digitally replaced, but a lot of this will apparently feature two 3D T-800s. They claim to have seen some of the models in the works and say they look fantastic, even in the early stages, but even with those reassurances, this news is going to concern many of you out there. This is all unconfirmed at this point, but Skydance did retweet the original Terminator Fans article, which lends an air of authenticity to the report. If it is successful, Terminator: Genisys is set to be the first of a new trilogy that resets some of the continuity of the franchise. The story, as we understand it at this point, revisits key moments from the earlier films, but shows them in an altered timeline. 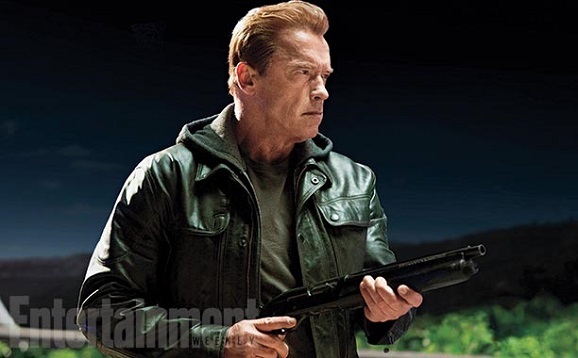 In this version, Sarah Connor (Emilia Clarke) was raised by Schwarzenegger’s T-800, who she calls Pops, and who has taught her to be a total badass from what we’ve seen in that trailer. Directed by Alan Taylor (Thor: The Dark World), Terminator: Genisys opens July 1, 2015, and stars Schwarzenegger, Clarke, Jason Clarke, Jai Courtney, Matt Smith, J.K. Simmons, and Lee Byung-hun. Some reports have said that we’ll see a new trailer next week during the Super Bowl.